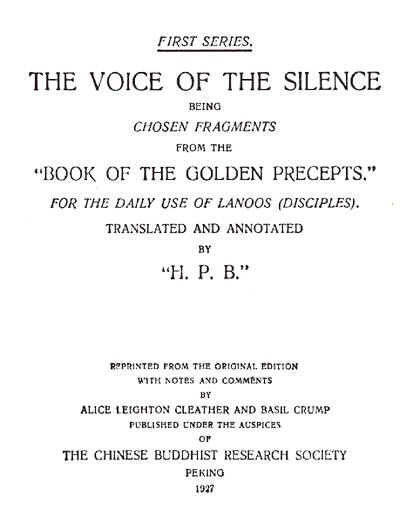 of "The Voice of the Silence"
added to the 1927 Peking Edition of the "Voice"
Written specially by H.H. The Tashi Lama for this Reprint. Editorial Notes and Comments to H.P.B. 's "Foreword"
Editorial Notes and Comments to H.P.B. 's "Preface"
Editorial Notes and Comments to Fragment I: "The Voice of the Silence"
Editorial Notes and Comments to Fragment II: "The Two Paths"
Editorial Notes and Comments to Fragment III: "The Seven Portals"
Editorial Notes and Comments to H.P.B. 's "Glossary"
Chinese Version of the Frontispiece: "The Path of Liberation"